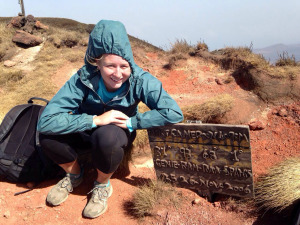 Carybeth Reddy, a former Global Health Institute intern and field course participant, wrote the following post on her blog, Ode to the Road. 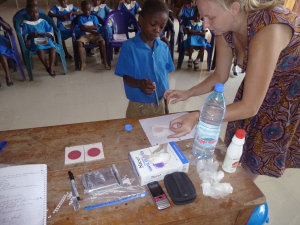 The UW-Madison 2012 graduate from the College of Agricultural and Life Sciences says her international experience while at UW-Madison motivated her to join the Peace Corps. 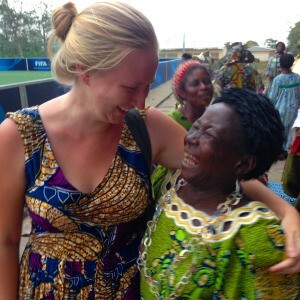 She’s in Cameroon as a Peace Corps volunteer working in community economic development. Coming off a not so great week as a Peace Corps volunteer, I decided to do the same. Days here can be frustrating, but I have moments almost daily where I stop and am reminded of the beauty of this country and the world. Because when I let go of the work frustration I feel and just sit under the stars with my neighbors to escape the heat inside, I feel at home. Because when I reached the summit of Mount Cameroon, the highest peak in Western and Central Africa, I felt so tiny compared to the vast volcano, but so powerful for having conquered its steep slopes. Because when that elusive dry season thunderstorm rolls in to provide a short break from the stifling heat, the whole town breathes a collective sigh of relief. Because as I sat in my apartment on the 19th anniversary of one of the worst days, wondering how I should feel or what I should be doing, my neighbor poked her head in to give me the first mango of mango season and I realized I should just feel what I feel. In that moment, it was pure happiness as I tore off the skin and let the juice roll down my chin. Because as I floated with my dad and sister in the clear water of the Mediterranean after more than a year apart, I remembered how lucky I am to have the best family in the world. Because when my favorite Besongabang mommy, who’s deaf, and I have a conversation – me speaking Pidgin so she can read my lips and her speaking Kenyung that I don’t understand, it always ends in fits of laughter that remind me that humans can connect, anywhere, anyhow. Because all arguments in Cameroon end in on est ensemble or “we are together” without any grudge being held. And that’s beautiful. Because when I walk through the field to reach the primary school in Besongabang to teach water and sanitation classes, I’m met with chants of “Auntie Cary!! !” coming out of the classrooms, reminding me how unique my life is in this moment. Because when my sister and 3 friends came to visit, all in the last year, my Cameroonian, Ecuadorian and American worlds all collided in a magical way. Because when I float in the Atlantic waves off the black sand coast of Limbe and stare up at majestic Mount Cameroon rising out of the tropical flora in the distance, I remember that I am fortunate to be here. What inspired you to love the world in the last year?